Items cannot be return or cancelled after payment has been made. Items will be exchanged if they were delivered damaged. Other than that, once payment has been made goods are untenable / non-refundable and order cannot be cancelled. This easy to follow, step-by-step guide offers everyone – from the total beginner to the expert groomer – the best professional tips and practice for grooming shorthaired/longhaired cats. 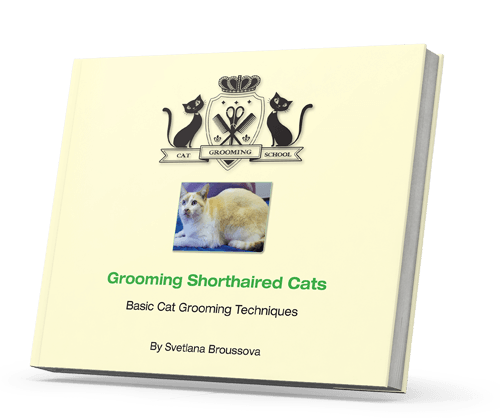 Author Svetlana Broussova is the owner of Pet Universe Grooming Salon and The Cat Grooming School, and she has over 20 years’ experience in the industry. Her funny, affectionate and expert teaching is thorough and entertaining, making sure the grooming experience is safe and fun for both you and your cat. 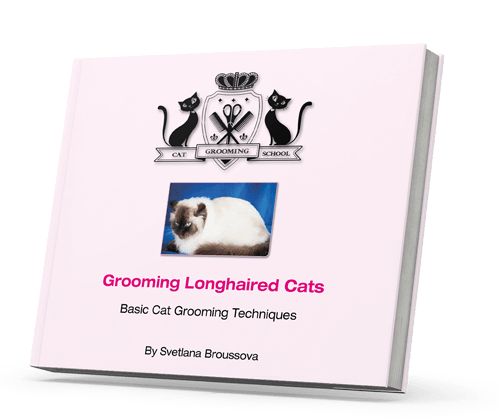 When I was looking for a proper course to start cat grooming, I found the website of the Cat Grooming School owned by Svetlana Broussova. I live in Belgium so it was not my first thought to go to London, but I saw on the Cat Grooming School website they had launched an online course, as well as producing books on basic grooming techniques for both longhaired and shorthaired cats. So I bought both books – I ordered them on a Friday, and by Monday they had arrived! Great service! I was not experienced at all in grooming but with these perfect manuals I learned so many things, thanks to their very good descriptions with detailed illustrations, and a DVD with each book. These DVDs are of great value because you can see the whole basic cat grooming process. I have since trained and started a career as a Cat Groomer. I think these books are an ideal guidance for people beginning as a professional cat groomer, and also for cat owners who want to do some grooming themselves at home. As a professional cat groomer of some 15yrs I believe there is always more to learn, so was pleased to see this new publication about cat grooming shorthaired cats (as well as the 2nd book in the series, Grooming Longhaired Cats). There are assumptions that shorthaired coats don’t need much attention, but I see many such cats at my grooming studio whose coats greatly benefit from grooming. This book is a wonderful educational resource covering basic grooming techniques and, importantly, emphasising gentle and compassionate handling, so that the grooming process is a positive experience for the cat. With its lovely clear photographs and descriptions throughout, and the accompanying DVD which demonstrates the techniques outlined in the book, it is the ideal manual for both new experienced cat groomers, as well as owners, wishing to learn more about grooming their own cats. Having spent the last year looking for a book on the subject of cat grooming, I have found these two books the most informative on the market. The books are clear and concise with helpful drawings and photographs. The added benefit of the CD with each books makes it a brilliant guide to basic cat grooming techniques. Both books are worth every penny and I would recommend to anyone with an interest in cat grooming, whether in a professional capacity or just for caring for their own cat.